by Oltmanns, Thomas F.; Emery, Robert E.
It's not about "them", it's about all of us. Abnormal Psychology, 8/e brings both the science and personal aspects of abnormal psychology to life with a focus on evidence-based practice and emerging research. Authors Thomas F. Oltmanns and Robert E. Emery present the most cutting edge information on abnormal psychology by covering methods and treatment in context. 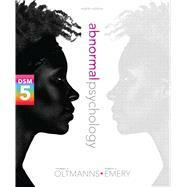 Organized around the way students learn, this title helps readers understand the biological, psychological, and social perspectives of abnormal psychology. The 8th edition has been updated to include DSM-5 information throughout. The authors have integrated DSM-5 into the fabric of every chapter in a thorough, critical way, helping readers think critically about these changes and discuss the pros and cons of the DSM diagnostic systems. MyPsychLab is an integral part of the Oltmanns / Emery program. Engaging activities and assessments provide a teaching and learning system that helps students think like a explore abnormal psychology. With MyPsychLab, students can develop critical thinking skills through writing, simulate classic experiments and surveys, watch videos on research and applications, and explore the Visual Brain in 3-D. This title is available in a variety of formats – digital and print. Pearson offers its titles on the devices students love through Pearson's MyLab products, CourseSmart, Amazon, and more. Thomas F. Oltmanns is the Edgar James Swift Professor of Psychology in Arts and Sciences and Professor of Psychiatry at Washington University in St. Louis, where he is also Director of Clinical Training in Psychology. He received his B.A. from the University of Wisconsin and his Ph.D. from the State University of New York at Stony Brook. He was previously a faculty member in the psychology departments at Indiana University (1976 to 1986) and at the University of Virginia (1986 to 2003). He is currently a member of the Board of Directors of the Association for Psychological Science, served as President of the Society for a Science of Clinical Psychology in 1993, and is President-elect of the Society for Research in Psychopathology. Undergraduate students at UVa recognized his teaching by selecting him to receive the “Outstanding Professor Award” in 1997 and 2002. His early research was concerned with the role of cognitive and emotional factors in schizophrenia. His lab is currently conducting a large, prospective study of the trajectory of personality disorders in middle-aged and older adults. His other books include Schizophrenia (1980), written with John Neale; Delusional Beliefs (1988), edited with Brendan Maher; and Case Studies in Abnormal Psychology (8th edition, 2009), written with Michele Martin. Robert E. Emery is Professor of Psychology, Director of the Center for Children, Families, and the Law, and an associate faculty member of the Institute of Law, Psychiatry, and Public Policy at the University of Virginia. He also served as Director of Clinical Training for nine years. He received a B.A. from Brown University in 1974 and a Ph.D. from SUNY at Stony Brook in 1982. His research focuses on family conflict, children’s mental health, and associated legal issues, and he has authored over 100 scientific articles and book chapters. His awards include a “Citation Classic” from the Institute for Scientific Information, an Outstanding Research Publication Award from the American Associate for Marriage and Family Therapy, the Distinguished Researcher Award from the Association of Family and Conciliation Courts, and several awards and award nominations for his three books on divorce: Marriage, Divorce and Children’s Adjustment (2nd ed., 1998, Sage Publications), Renegotiating Family Relationships: Divorce, Child Custody, and Mediation (1994, Guilford Press), and The Truth about Children and Divorce: Dealing with the Emotions So You and Your Children Can Thrive (2004, Viking). His current research is on genetically informed (twin) studies of the effects of major changes in family environments, including divorce, harsh parenting, early menarche, and teen pregnancy.